Pretty much all of Friday was spent on airplanes but I thought I'd mention it anyway. It doesn't actually count as day one of course but it's something to take up space alongside all these pictures. We did get to Fort Lauderdale early enough to have a relaxed lunch before the flight to Philadelphia. In Philadelphia, it turned out we had to walk about 3 miles to get to our connection. We took a quick break outside for Melanie to smoke her last cigarette and then went to the international terminal where it turned out there was a 30 minute line just to get through the metal detector. At that point we had 20 minutes until our flight left, and right when we got to the bathrooms they announced final boarding for it, so we skipped that and just got on the plane. Sort of unprepared, with no currency exchanged or anything. We had the last seats in a cabin which sucked because they wouldn't recline. So it was an uncomfortable 6 hours. They showed Tomorrow Never Dies, which was something to do for 2 hours I suppose. The food was good though. I had goulash on a whim, and it turned out to be quite tasty. Melanie slept a little, I started and finished the book "The House Made of Dawn" which I don't recommend, and I really don't know how it won a Pulitzer Prize. The sun was just rising when we landed, and it was too foggy to see much of anything. At 7 AM, (now on the actual day one), Charles de Gaulle airport was completely deserted. We took what appeared to be an infinitely long people mover to the terminal, which was a confusing mishmash of elevators and escalators and windy staircases. We got our luggage without incident, and there really was no customs at all. We just walked right out and didn't even get a stamp. In fact, we never got a stamp the whole time. hmmph. I used my credit card to get some basic money from the ATM so we could get to town. We took a bus (Roissy Bus!) from the airport to the Opera House. It was still early, and we had to circle the opera house to get to the Metro station so we got a good look at it. No Phantom in sight however. The Metro turned out to be really useful, I think we probably rode it 100 times in the four days we were there. We took the metro to our hotel, which was about 2 blocks from the station, and easy to find. We left our luggage there and suddenly there we were in Paris, it was still very early, and we had to do something until our room was ready. We walked to Notre Dame which was a couple blocks away and incidentally is what all these pictures have been. 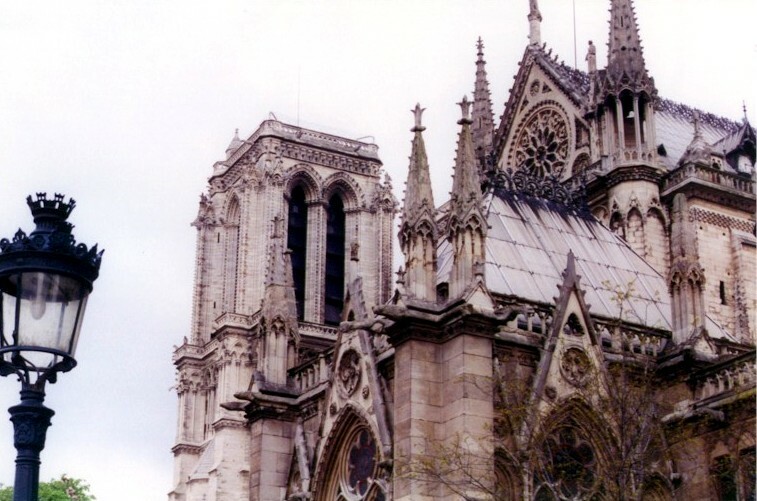 The first is a view from behind, which is the best view of the flying buttresses. 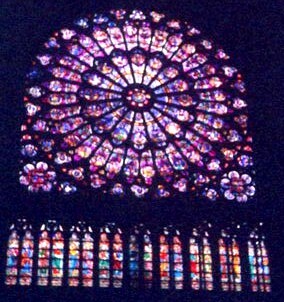 The second is the famous rose window inside, and the third is a close up of the top of the front entrance. It was really crowded inside with about 2 zillion tour groups at least half of them Japanese. The church was impressive, but sort of hard to enjoy with so many people there. In retrospect, it was my least favorite of the three big cathedrals we visited. 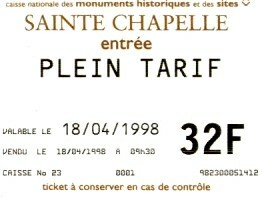 We also didn't go in the tower or the crypts, because we had forgot to get our museum passes at the hotel. We left thinking we'd go back later when maybe it was less crowded but we never really did. Next we walked the few blocks to the Palais de Justice, where St. Chapelle is located. 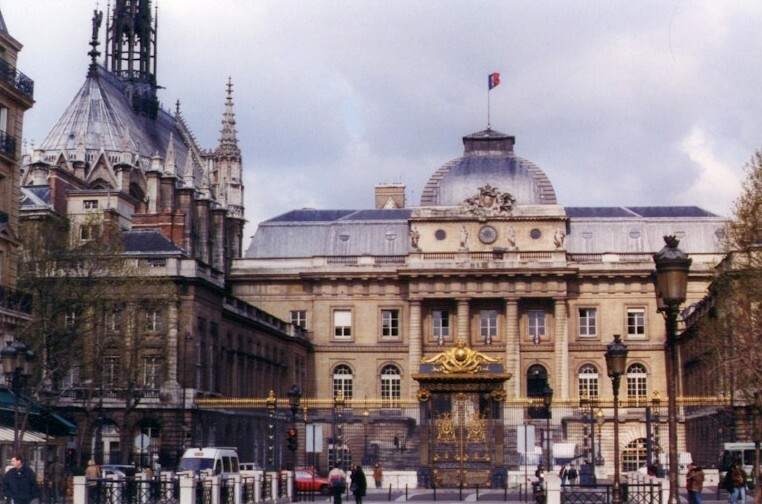 The building with the dome and the flag is the Palais de Justice, currently used as a courthouse, but a few centuries ago it was the site of the guillotine used during the French Revolution. The cathedral just to the left is St. Chapelle. 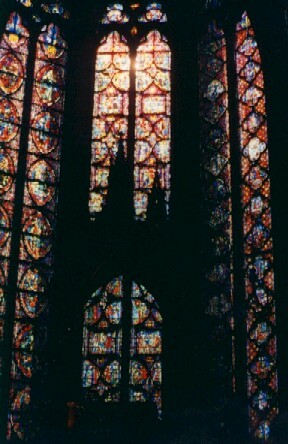 St. Chapelle is divided into two sections, an upper and a lower cathedral. The lower cathedral was for servants and members of the King's court. 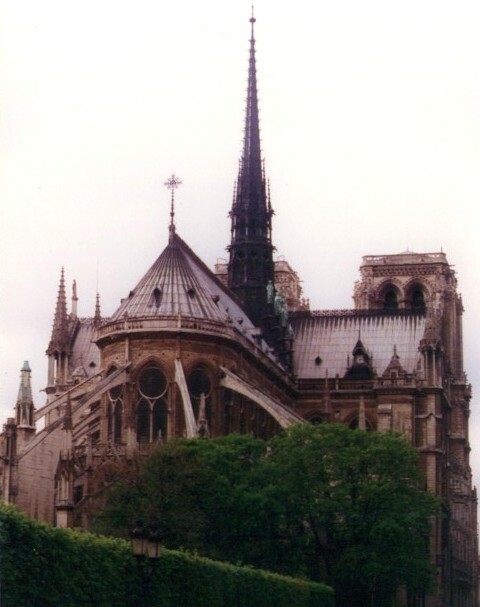 It's rather colorful, but dark as it also serves as the foundation for the upper cathedral. 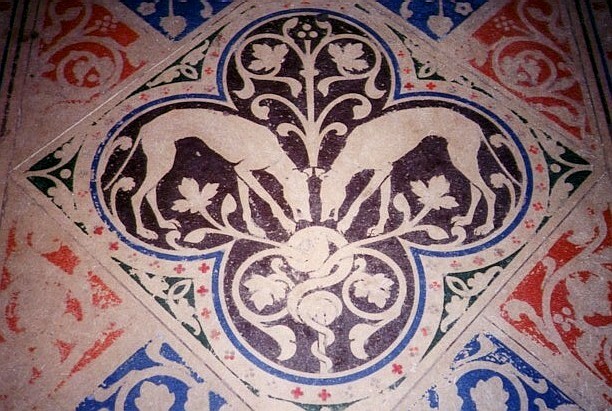 Shown here is a segment of the floor. The upper cathedral was reserved for members of the royal family. The cathedral is completely surrounded by stained glass windows which tell the entire story of the bible. Each window (the pairs of tall strips of glass) represent one book of the bible. Informative cards printed in many languages take the time to explain where on each window each story is located, but most of the window is too high to see well anyway. 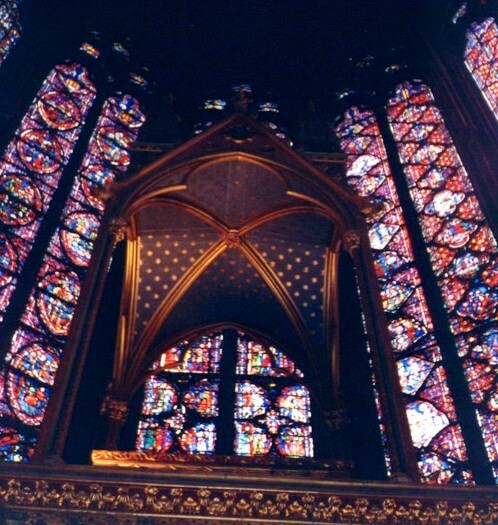 This last image of St. Chapelle is looking up towards the altar and the stained glass windows behind. After St. Chapelle we wandered back to Ile St. Louis (the little island behind Notre Dame). It was really cute with lots of little boutiques, and we decided to come back later and buy things, but we didn't. Maybe next time. Instead we went back to the hotel and checked into our room and got our really useful museum passes. Then, going against all conventional wisdom about jet lag, we took a nap sort of by accident, and woke up four hours later when the phone rang. Except I didn't know it was a phone, it was a different sounding ring and in my dream it had been a wounded quail, so I sat up completely disoriented and couldn't find a quail anywhere in the room before the phone stopped ringing. (It later turned out to be Melanie's mom). 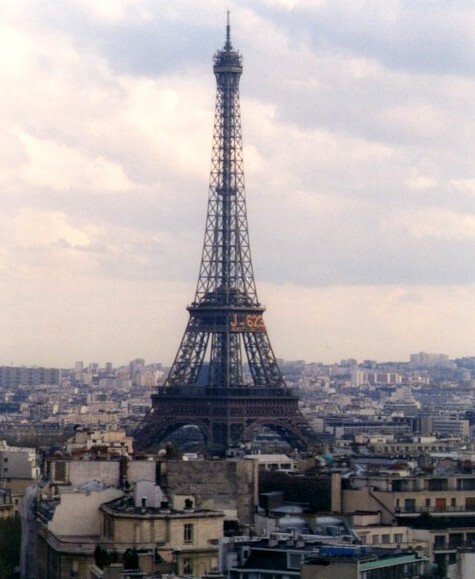 Since we were now up, we went back out to Paris. We walked all the way to the Louvre, and then around it. It seemed dangerously large but that's a story for day two. 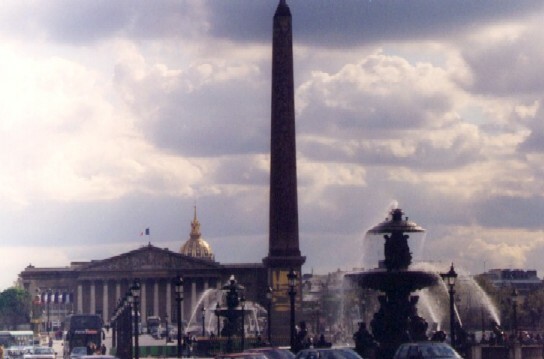 Next we walked through the Place de la Concorde (pictured here) managing somehow to avoid being killed in traffic. 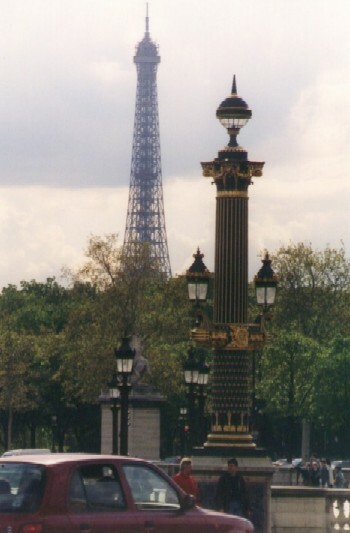 There are two fountains, twelve statues and countless elaborate light poles on pedestals like the one shown here to make driving more fun, and walking more life threatening. At that point we finally ate at a little stand in a nearby park, and our first Paris meal was a hot-dog. Actually it was a french hot-dog. It was on a baguette and covered in melted gruyere cheese, and it was really good. Melanie discovered Orangina to drink, and would become addicted to it for a few days. She later discovered European Orange Fanta was far superior to American Orange Fanta and drank several cans of that per day until we left. At this point we were at one end of the Champs-Elysees, so naturally we were obliged to walk to the other end of it (one and one quarter miles if you're curious). 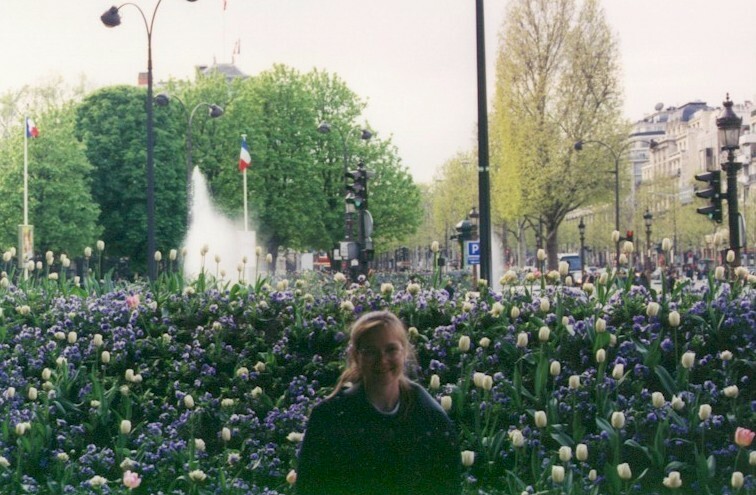 These two pictures were taken standing in the middle of the Champs-Elysees. We hope you appreciate these fine artistic specimens that we risked our collective lives for. 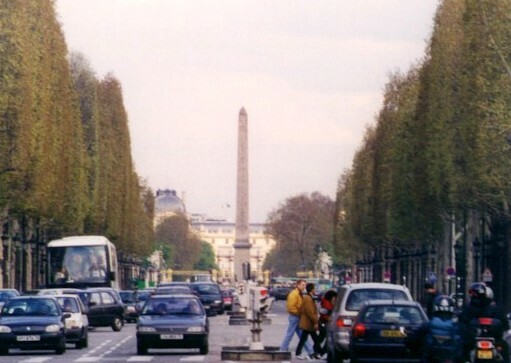 One direction is the Place de Concorde, with authentic Egyptian obelisk. At this point we'd like to take a moment to prove that this is actually us in Paris and not pictures stolen from someone else's web site. So here is Melanie relaxing amongst some fleurs alongside the road somewhere. She is smiling because she just recently had another Orangina. 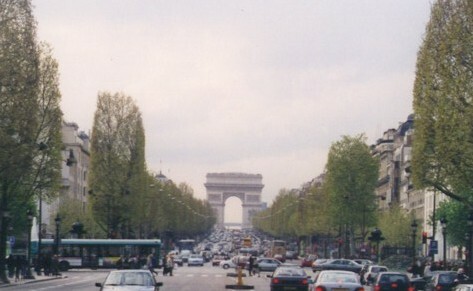 We continued down the Champs-Elysees until we arrived at the Arc. There was some sort of procession/parade thing going on there which was nice enough to block traffic for us so we could get to the Arc. We're not sure what the parade signified but it ended in all the flowers being placed here next to the eternal flame which doesn't quite seem to have made this picture, but trust us, it's there. 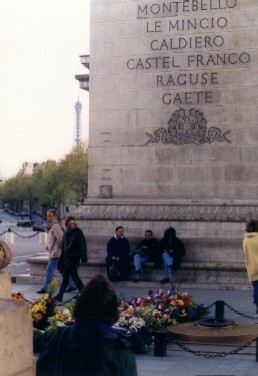 Notice the Eiffel Tower in the far distance which we would walk nearly the entire way to next. Once you finally get to the top, the view is pretty spectacular. We took approximately 4 rolls of film worth of pictures, but here are the highlights in the various directions. This shot is to the west showing 'downtown'. The large squarish arch is La Defense. 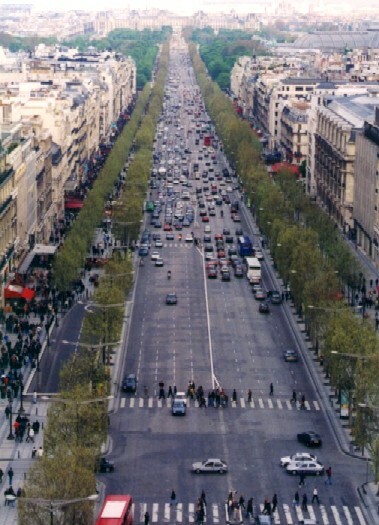 This is to the east, showing the entire length of the Champs-Elysees. Down amidst those chestnut trees are hundreds of confused tourists paying $6 for coffee at outdoor cafes. To the south is the Eiffel Tower, and somewhere amidst the buildings in the foreground of this shot is the Seine River. Not entirely visible here on the near side of the Eiffel Tower is a huge digital sign which shows the number of days until the year 2000, which is useful for dating your pictures, but not much else. This, as you may have guessed, is the north. 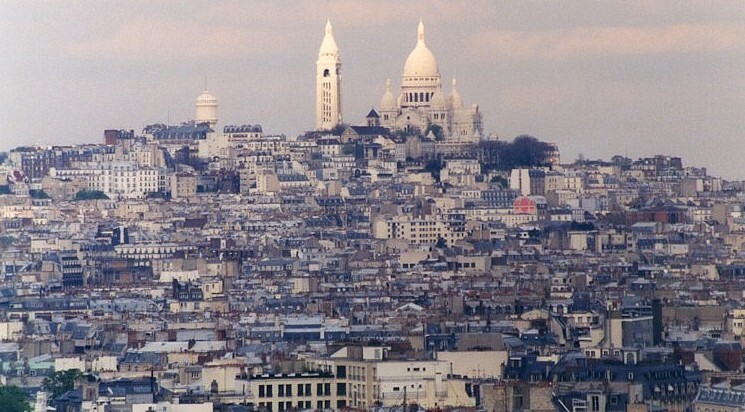 This cluttered little hill is Montmartre, with the Basilica of Sacre Coeur perched on top. 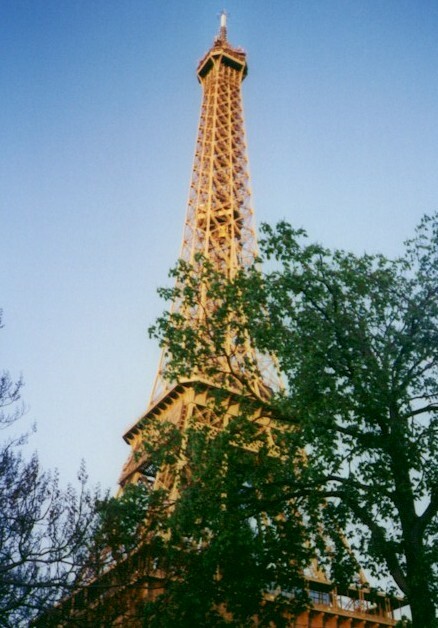 This may also be the closest thing to blue sky that occurred while we were in Paris. 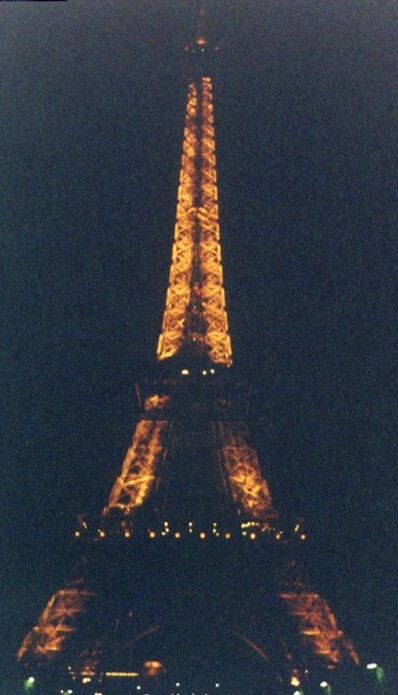 And now, at last we arrive at the Eiffel Tower, and yes it's still the first day. But believe me, however exhausted you may be from reading this page, it was more tiring to actually be there. The natural response to anyone who hasn't been to the Eiffel Tower who sees this picture, tends to be: "It's really that color?". The answer is, "Yes, what color did you think it was?". We first went up to the second deck and had coffee while watching the sun set. (Romantic, isn't it?) 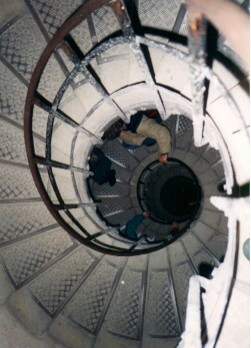 Then we went the rest of the way up to the topmost part and took a few pictures in the gathering gloom that didn't really turn out, so you'll just have to go to Paris to check out the view yourself. Hopefully when you go, there won't be an entire 7th grade class from some middle school in New Jersey on the elevator with you.